What’s the value of mobile chat apps? Investors have been scratching their heads about the topic ever since Facebook slapped a $19 billion price tag on WhatsApp earlier this year. The recent backdoor listing of South Korea’s Kakao offers a new data point. But its user metrics and revenue numbers still offer a mixed message on valuation. Kakao’s $3.3 billion listing, through a reverse takeover of Daum Communications, looks like a relative bargain. Based on the South Korean internet portal’s closing share price before the announcement, the deal values Kakao’s 145 million registered users at just under $23 each. That looks good when compared to the $40 Facebook paid for each of WhatsApp’s active monthly users. However, it’s more than twice the $9 per registered user that Japanese e-commerce group Rakuten paid for voice-messaging service Viber earlier this year. Comparing customers is an inexact science: the number of people who have downloaded an app is not the same as those that use it on a monthly or daily basis. Business models also differ. 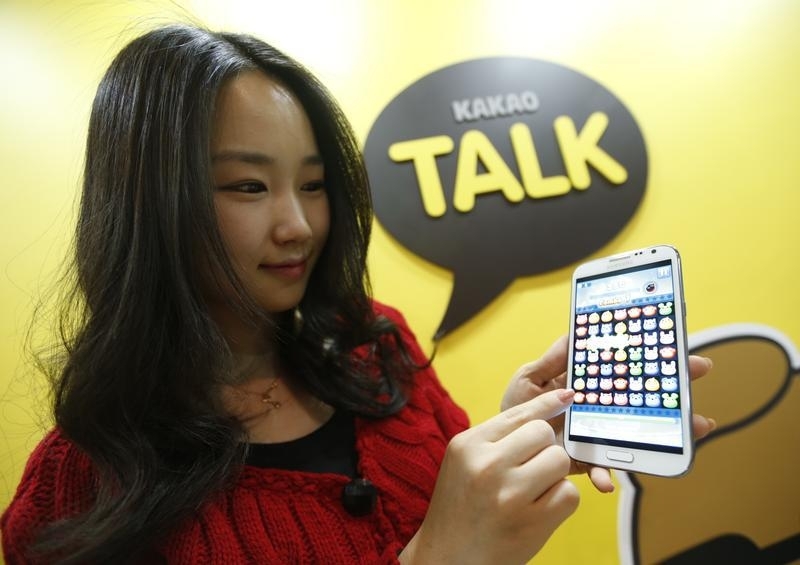 Unlike some rivals, however, Kakao is actually making money from its users. It generated over $200 million in revenue by selling games and stickers in 2013 and booked an after-tax profit of $59 million. Kakao’s nearest rival is probably Line, the dominant chat app in Japan. If its 400 million registered customers were valued at the same price as Kakao’s, it would be worth more than $9 billion. Apply Kakao’s multiple of 16 times revenue to Line’s $338 million of sales in 2013, however, and the Japanese group’s implied value falls to $5.4 billion. No wonder investors in Line’s owner, the $24 billion South Korean group Naver, struggled to understand the implications of the Kakao deal and sent its shares down over 4 percent on the news. Kakao’s backdoor listing may have provided investors a glimpse of how investors value a profitable chat app. But on the limited information available, putting a price on mobile chat is still anybody’s guess. Kakao Corp, which operates South Korea’s most popular mobile messaging chat app, sold itself to listed Daum Communications in a $3.3 billion all-stock merger on May 26. The back door listing speeds up an initial public offering which the company had been planning for 2015. Daum will issue 43 million new shares at a ratio of one new Daum share for each 1.56 Kakao shares, according to the announcement. Daum will issue 43 million new shares, of which 33 million will be common shares and the remaining 10 million will be preferred stock. Based on Daum’s last trading price of 78,100 won per share on May 25, the deal is valued at 3.35 trillion won ($3.3 billion) on a fully-diluted basis. The combined entity, Daum Kakao, will have a market value of over 4 trillion won. Kakao generated revenue of 210.8 billion won in 2013, primarily from games and stickers sold on its messaging app. The company reported net profit for the same year to be 55.6 billion won. The app has approximately 145 million users globally. Daum shares rose 15 percent to 89,800 won on May 27. In 2012, Chinese gaming and social media giant, Tencent, which operates a rival messaging app WeChat, bought a 13.5 percent stake in Kakao for $63 million. In February this year, Facebook bought mobile messaging service WhatsApp for $19 billion. In the same month, Japanese e-commerce group Rakuten purchased Viber, another mobile messaging app for $900 million.